Azzedine Alaia, stenciled leopard, pattern on pony skin wide ( corset ) belt having studded brass embellishment and leather laced edging with triple buckle closure. 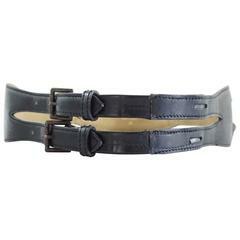 Rich dark brown leather corset belt designed by Azzedine Alaia dating to the 1980'. Labeled a French Size 65 which fits a size 23-25" waist. Made in France. Excellent condition.